Hôtel de Sully houses the head office of the Centre des Monuments Nationaux and is not open for visits. 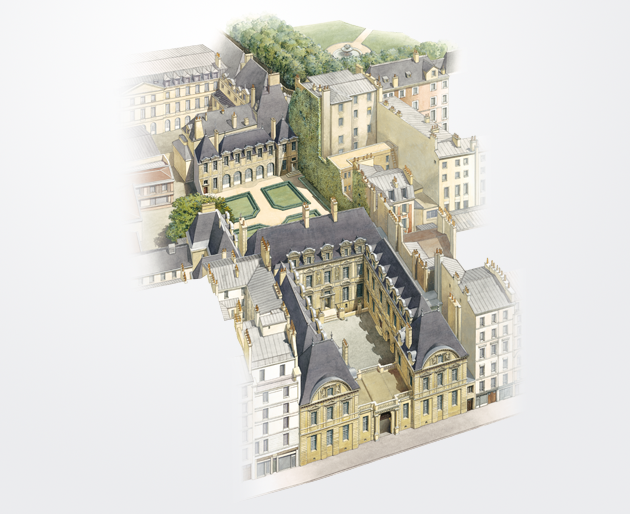 It is, however, possible to cross the courtyard and the garden during business hours, between 9 a.m. and 7 p.m., to gain access to the Place des Vosges. The Book Shop is open from Tuesday to Sunday: 1 p.m. to 7 p.m.
Booking required on 01 44 61 21 50 or 01 44 54 19 30, groups of 16 people maximum. Assembly in the courtyard of the Hôtel de Sully 10 minutes before the tour. N.B. : Booking will only be confirmed on receipt of payment by cheque made payable to "Régisseur de recettes Visites-conférences" sent to "Visites conférences" - Hôtel de Sully, 62 rue Saint Antoine - 75004 Paris - France. The “Librairie de l'Hôtel de Sully” bookshop is designed to present the wealth of our national heritage in the broadest sense of the term (regions, architecture, gardens, as well as cuisine, etc.). It has a unique collection of this kind of book, starting with those from the Editions du Patrimoine, all of whose publications are available here. The bookshop is open every day from 1 p.m. to 7 p.m. It is closed on January 1st, May 1st, November 1st and 11th and December 25th.